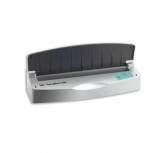 Fellowes Helios 30 Thermal Binder 5641101 Pack of 1 Fellowes Helios 30 Thermal Binding Machine. A unique office thermal binder with an efficient ergonomic and safe design. Variable binding cycle for documents up to 30mm thick maximum binding capacity 300 sheets HeatShield safety barrier and folds flat. 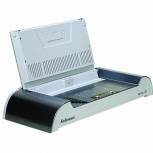 GBC ThermaBind T200 Thermal Binder With Adjustable Heat Settings GB23482 Pack of 1 Simple to use thermal binder binds up to 200 A4 sheets. Features cooling tray, audio and visual cycle complete signals and fixed timer fast binding.